Note the compound (pinnate) leaves which are typical of the pea family; (fabacea). Different than most trees, they prefer full sunlight and dry soil, so often they can be found in disturbed areas, and edges of forest where there may have been some disturbance to the soil is where i would suggest to look for them. The flowers grow large fragrant clusters and eventually your nose will lead you to them; they have the sweetest smell carried by the air. I remember when I finally realized that what I was smelling every year was indeed these blooms. They really only stick around for about a week and they taste like floral snap peas. The flavor is out of this world delicious. It’s important to note that when I collected and dehydrated then they lost their floral flavor and scent, so I prefer to collect and eat them fresh. Many cultural dishes around the world batter and fry these flowers, including tempura style from Japanese cuisine. The plant is also a nitrogen fixer, due to it symbiotic with nitrogen fixing bacteria on its roots, and it has been grown for fence posts. And it makes a durable hard wood which is very rot resistant. The seeds can also be collected in fall and they can be soaked and boiled as a legume. The leaves and the bark are said to be poisonous. May every day be Earthday!!! 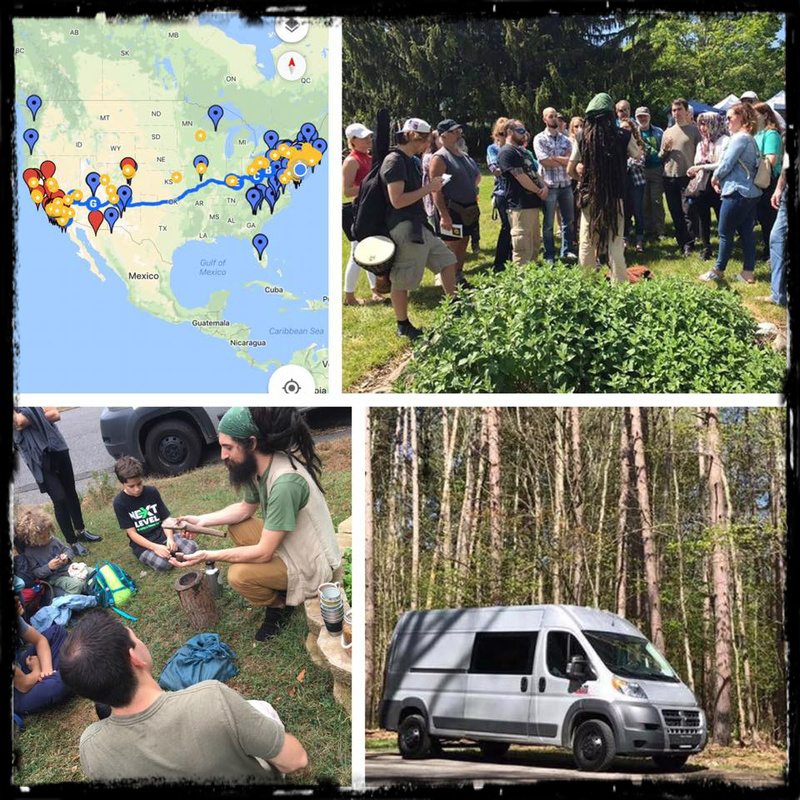 As the foragemobile tour east gets underway, I invite you to join in the returntonature #savetheseeds initiative to grow your own medicine and help preserve seed biodiversity as a community! On my journey, I have collected several wildcrafted and have been hand winnowing seeds into packets ready for a home! Every seed is a unique diverse lineage, and it feels a part of our birthright to caretake the garden, back to Eden, one seed at a time. I would be happy to send you sustainably wildcrafted, small batch, hand winnowed seeds, along my travels, and you can help this mission by making a donation toward this initiative which helps this vital Plant knowledge spread. The donation request is an open offering, at a minimum please help cover shipping. 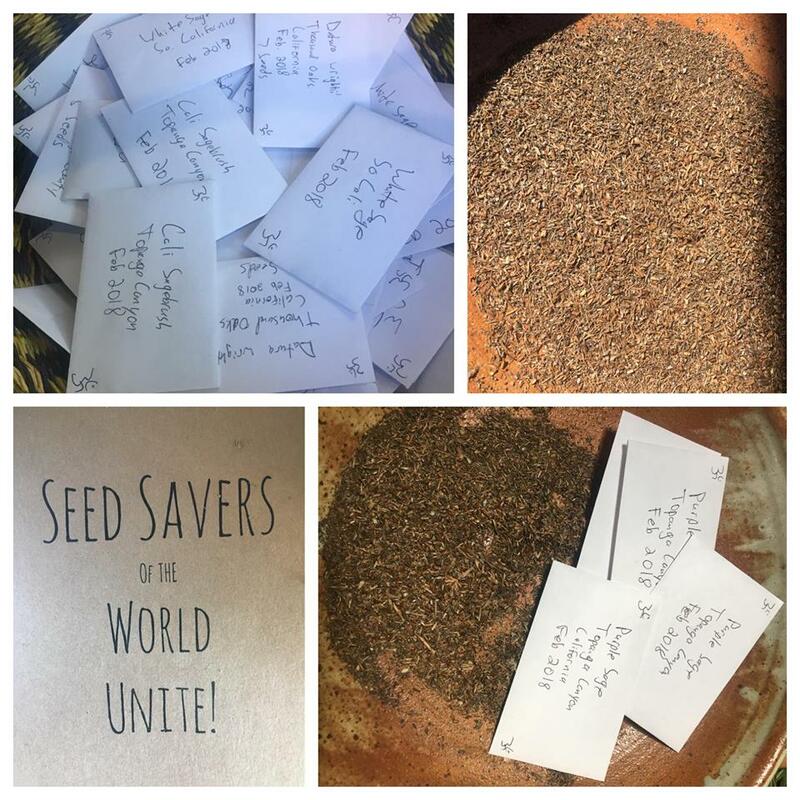 all donations will be put toward helping these teachings and seed saving, as well as ethical caretaking discussions, and can be offered to: Paypal.me/returntonature – in the note add your address, and which seeds you would like. Also, if you see a plant that I’m sharing about, that you would like to help grow, message me, and ask! So far I have limited amounts of white sage, black sage, purple sage, Yerba Santa, California sagebrush, Cali mugwort, datura wrightii, carob, and horehound! And, lots more coming soon! Please remember that sages need to be stratified to germinate. Make sure if you paypal that you add what seeds you want in the description! Please do share below if you got your seeds, and how they’re doing. And please tag me in pics of progress and use the hashtag #savetheseeds as your seed tending project grows! Thank you Miranda Guzman Fernandez for this beautiful video of our weekend retreat on Jan, 2018, in the garden teaching the “sacred ecology retreat” where we taught a mix of interacting with nature in a regenerative way from foraging to dancing. Grateful to Centehua Sage and the wisdom sharing of the weekend and to all who came. And thank you Erik Hjermstad and Dennis Sharmahd for adding your blessed green wisdom into the circle. All along the ground are thousands and thousands of pine nuts, but many of them have already seen better days. it’s day 4 with morning temps dropping into the 30s. Each day is filled with walks across the mountain landscape, seeking and harvesting the remaining pine nuts, wild teas containing pine needles, and juniper tips, and Mormon tea. The silence is astounding at 8000 ft up, and the only company I have are birds and elk and the shelter of the foragemobile. The vistas are profound, especially when the sun lights up the horizon in the morning time. There is barey any cell phone service, and to get WiFi, the little town library will do. This is a sacred place, where ancestral practices still could thrive, where there is enough material; food, shelter, and medicine, but so far water is lacking. It is out here somewhere though. In a way, all modern humans are born into a survival situation with nature, instead of being born into a tribe which already knows where the resources are, what paths to find the best stands, the flowing waters, and the rare plants. This exploration, for me, is a constant journey, where only the spirit of the forest guides my way. Within those voices, the ancestors of the land speak, if we get quiet enough to listen. The landscape is the teacher, and our senses know. Meditation and self reflection are my reasons for coming, and I ask the elements for help in that quest. A lot of insights and visions come, when we plug in to the inner net. Sitting with the fire, intent on its whispering message, contemplating the light, and the burning wood. How integral humans are to the health of the ecosystem. Sitting at the fire, I am releasing decades of sequestered sunlight back into the heat and light that the trees have absorbed and acquired, now released to keep my fingers warm enough to type, and my cup always full of wild tea. When I burn wood, not only do I serve an ecological function by burning debris which could catch and start huge wildfires, which I suspect will but this is also an ancient achemical ritual that the ecosystem craves. Imagine that the branches of trees are gifts for the energy needs of their children; the humans. As I leave the pile of ash, which I also use for cleaning my camp cookware, the winds will spread the ash throughout the system. Free standing minerals are available. The ash contains mineral nutrients in which every Plant or tree that gets a taste, gets an edge up on how big and strong it can grow, and the ecosystem craves it. Basically we are performing an important ecological function for nature itself. For, out here, only the caring hearted can survive. When you give, you receive… a simple ecological ethical standard. Out here, we still have the chance to no longer be people with serial numbers, we are able to be raw feral spirits, humans seeking the union of ancestral skills, and the contemplation of the union of the spirit and matter. Creator and creation. Where nature and god aren’t separated. The more I sit with this space, the more I am convinced that we have not been banished from Eden, but since we believe we were, we treat nature in turn. We can’t see it, so we trash it. Here’s a look at the upcoming Cali tour in the works for January! Let me know if you’re in the area! Let’s link up, get inspired, discuss the sustainability revolution, and go exploring! The first weekend, I’ll be teaching a weekend foraging and Fermentation retreat in Los Angeles at an awesome urban permaculture homestead (see class links below). We will culminate Sunday evening with and organic potluck (bring your own bowl and eating utensil, and a dish to share) followed by a tea ceremony led by Katya Laurentia​. Join us for a weekend not to miss! From there I’ll be headed to The Long Beach area to teach at in the Green Wisdom Herbal Studies​ school hosted by the incredible Julie James​, a local herbalist who has lots of great wisdom to share and a full list of upcoming classes. Also in the works are collaborations with Pascal Baudar​, Lanny Kaufer​, and interviews with Lorenzo from Psychedelic Salon​ and James Adams​, Chumash healer. And, remember #returntonature is a people led movement! please help spread the word to those you feel would enjoy or benefit from these and many more upcoming classes! Here’s a look at mistletoe growing in the desert. Mistletoe, Viscum Album. 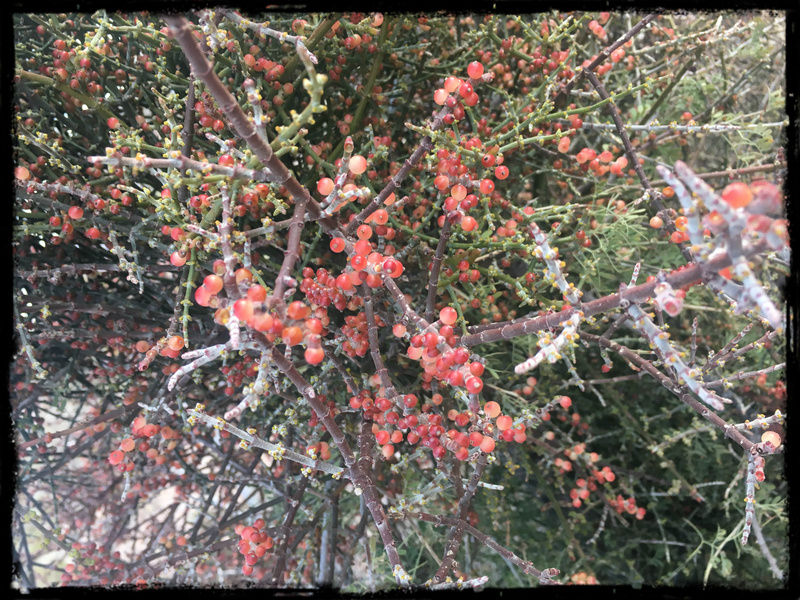 The familiar, white-berried plant of the winter holiday season, is a parasitic plant that grows on the branches of several species of trees, including several in the desert mid-west. Mistletoe burrows roots into the inner wood of trees and feeds from their sap, and is known as parasitic. Now a days, we are such a plant phobic culture that people are too afraid to bring this into their house because it is indeed a poisonous plant. Yet, they may have no problem having house plants which are of equal toxicity, and plenty of cleaning products which are much more toxic. The tradition of kissing under the mistletoe is yet another pre-Christian ritual that was swallowed up and assimilated by the Catholic Church with no question or tradition as to why. It is more likely that mistletoe was applied as a talisman or sache to attract love, as was a thriving folk tradition with many plants. Medicinally, Mistletoe has been used for centuries in traditional medicine for a variety of conditions including seizures, headaches, and arthritis. Today, mistletoe is also used in Europe as a treatment for cancer. During each season, you’ll receive a care package of various organic and wildcrafted goods for your everyday healing needs. Throughout the year, you will get to sample our delicious and healing tea blends, raw chocolate, elixirs, tinctures, salves and so much more! About the CSA model: The benefit of being part of a CSA is, each dollar spent becomes a vote toward the community itself choosing what thrives, and helps provide local business the funding it needs for supplies throughout the year. 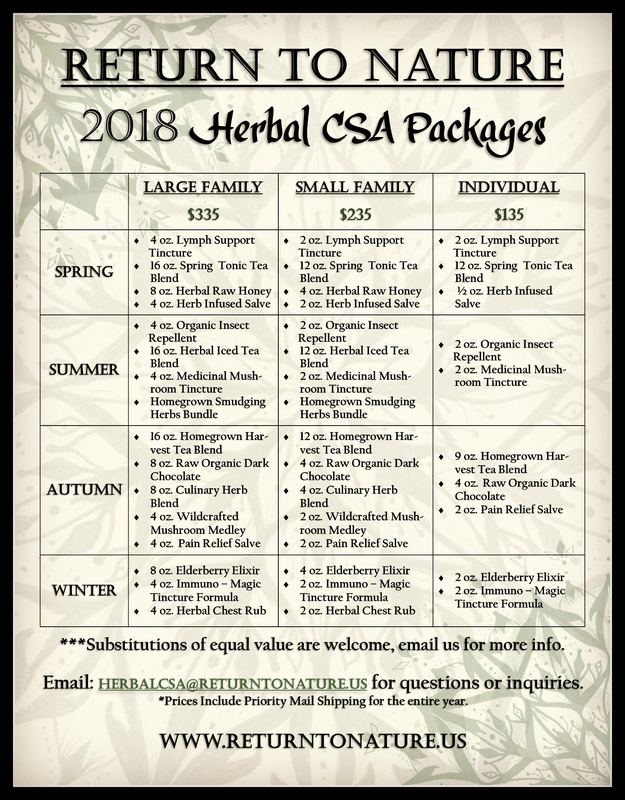 Joining our yearly CSA is a great way to sample a variety of our goods throughout the seasons while building your own home apothecary as an active participant in our growing herbal community. We are eager to hear your questions, feedback or suggestions and look forward to creating and sharing the magic with you all! *Sign up by December 21st 2017 and receive $12 off the yearly subscription cost. Only 20 shares are available for 2018…don’t miss out on the magic! 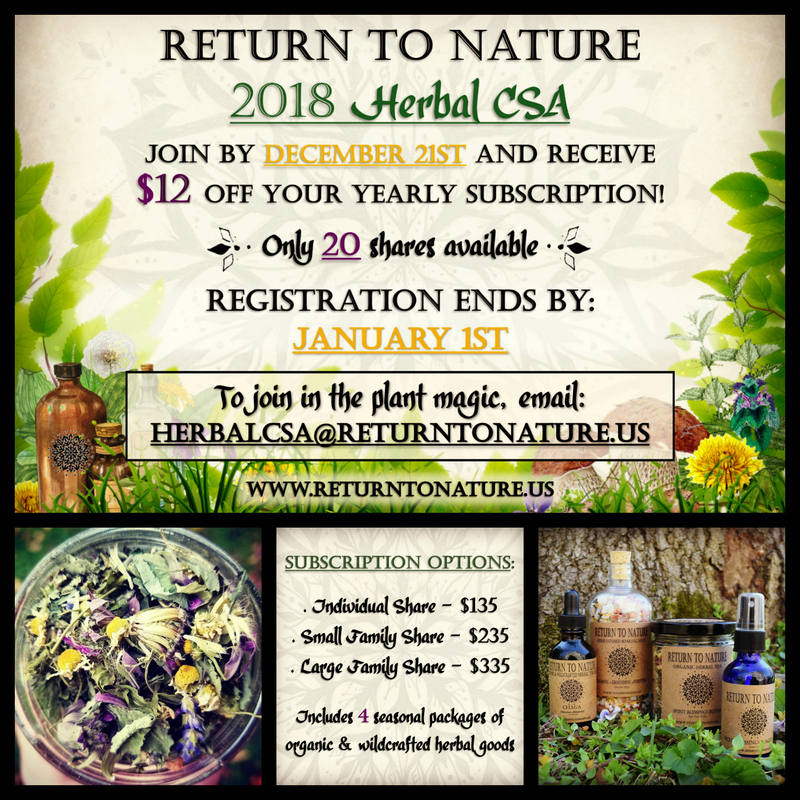 How to Order: To be part of this unique opportunity, Send the total payment for the Package of your choice to: paypal.me/returntonature. The program starts in March of 2018! Let us know if you have any questions! 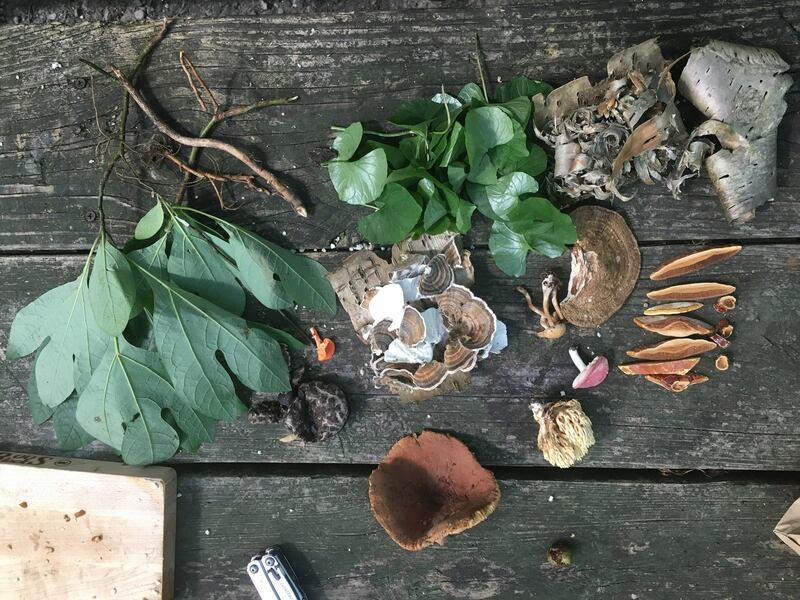 – Wildcrafters Materia Medica: Learning the healing and edible applications of many wild plants throughout the year, which bodily organs the plants and constituents effect, and how to harvest in their proper time and way. – Constitutional Herbalism Practice: Plant Sense Meditations: Direct field practice of awareness of the 6 tastes of Ayurveda and how that directly correlates to medicinal application and organ systems, study of the doctrine of correspondences and signatures, and how to correlate our sense perception with medicinal applications of plants. – Herbal Medicine Making with Backyard Allies: Students will receive step by step directions and live streams to make common helpful home remedies together, from infused oils to tinctures, and delicious meals. – Monthly Live Webinar videos: On the 4th Wednesday of each month (see dates below) with assignments, discussion, Q+A, and seasonal plant walk awareness – Each video will be available to watch live, or a playback file will be posted in the group, and you will be able to attend the “playback only”, but live is recommended. – Access to our “Return to Nature – Monthly Online Mentorship 2017” Facebook Group: Here we will discuss plant identification, projects, and ask questions, as well as all learn together. – Monthly Assignments Including Plant Identification “Scavenger hunts”: Students will develop their identification practice, checking identifications with the group, learning plant families, and basic botanical terminology. Hope you will join us for an awesome year! If you appreciate these teachings, please consider making any donation to Paypal.me/returntonature help this mission sustain itself and continue to bring these teachings to you! Huge thanks to everyone who came out to yesterday’s class! It was a lot of fun to share with such knowledgeable Plant people. There’s a great scene developing in Cincinnati Ohio, and Enright is an awesome hub for it. They have around 40 acres of forest, farm, and housing, which is dedicated to community, sustainability, and waking up the people. There were so many plants to discuss, some of them were gill over the ground, daylily (seen here), heal all which was still in flower, and one of my favorite wild fruits, hackberry. Hope to see you there, and please help spread the word! Huge thanks to all who donated to our 24 hr facebook Foragemobile fundraiser! Your donations helped me compensate for part of the cost of the solar set up, and gave me funds to plan the winter tour (dates below) with lots of webinars and online classes, as well as in person classes and live question and answers from all throughout my travels, all with the help of solar power! 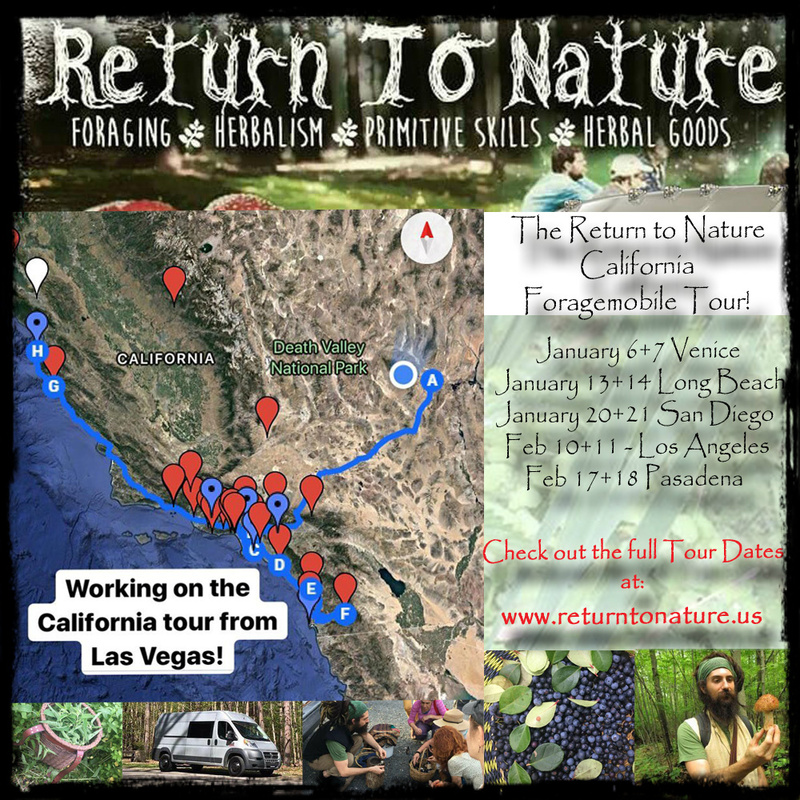 Also, the Return to Nature #foragemobile is headed on a westward teaching tour this winter! I’m working on a winter westward tour, starting in Monroe, New York at Ananda Ashram on October 28-29, Foraging and Herbalism Retreat (The Yoga of Plants)​ where I will be teaching a weekend foraging and herbalism retreat to start the tour off; I hope to see you there! 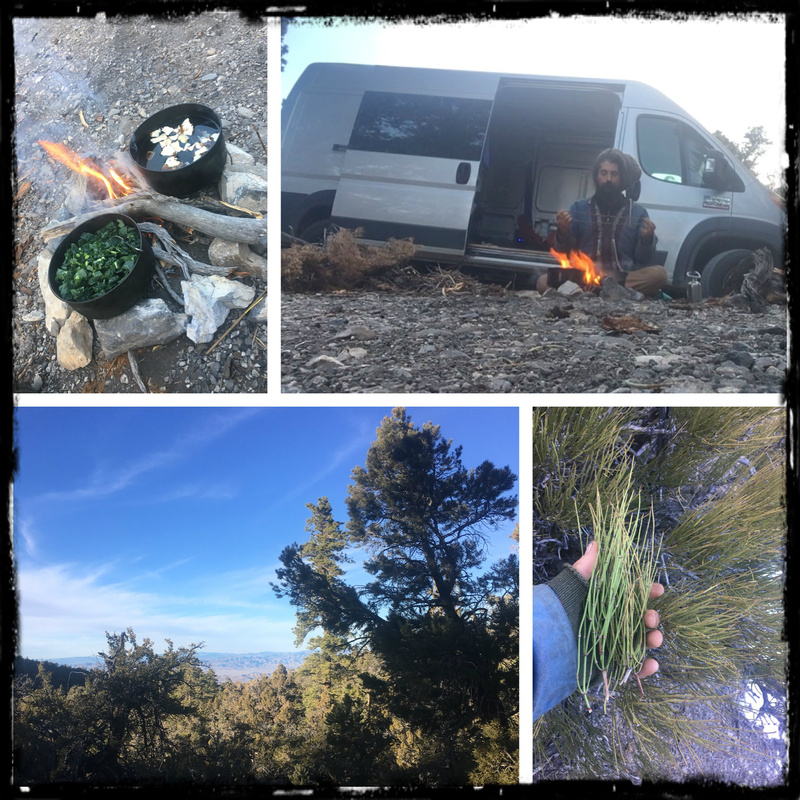 Then I’ll be headed to Prescott, Arizona, November 25-26 for classes on herbal medicine making, and then classes TBA in Nevada, and a California tour by mid December! Stay tuned for those dates and locations soon, and be in touch, and help spread the word and flyer if you’re in the area!